Khashoggi, a critic of Saudi Crown Prince Mohammed bin Salman, was killed at the kingdom's Istanbul consulate by a team sent from Riyadh. Saudi authorities have acknowledged that the killing was premeditated, but his body has not been found. When asked on a visit to Paris whether Canadian intelligence had heard the Turkish recordings, Trudeau said: "Yes", although he added that had not heard them personally. 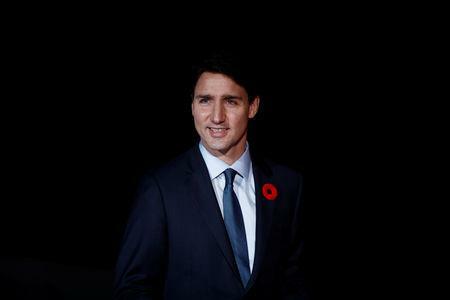 "Canada's intelligence agencies have been working very closely on this issue with Turkish intelligence and Canada has been fully briefed on what Turkey had to share," Trudeau told a news conference. He is under pressure to freeze the contract for armored vehicles built in Canada by U.S.-based General Dynamics , although the deal underpins 3,000 jobs in the small city of London, Ontario. Sidestepping a question on whether the recordings could change Ottawa's relationship with Riyadh and have consequences, Trudeau said he was continuing to talk with allies about the investigation and accountability for those behind the murder. "We are in discussions with our like-minded allies as to the next steps with regard to Saudi Arabia," Trudeau said. Earlier on Monday, French Foreign Minister Jean-Yves Le Drian said Paris was not in possession of recordings related to Khashoggi's killings, apparently contradicting Erdogan's remarks. "The truth isn't out yet. We want to know the truth, the circumstances of his death and the identity of the culprits. Then we will take the necessary actions," Le Drian told France 2 television. "If the Turkish president has information to give us, he must give it to us. For now, I don't know about it."